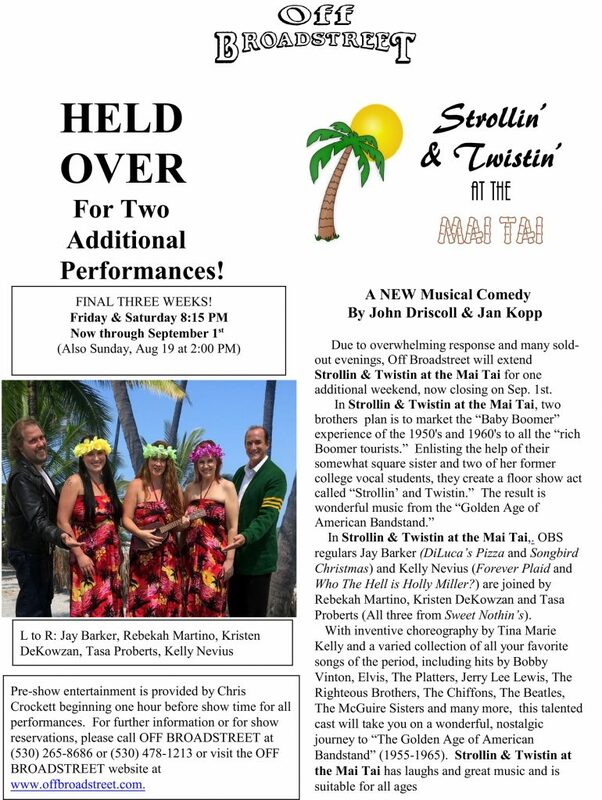 Strollin & Twistin at the Mai Tai – Final Weekend! weekend, now closing on Sep. 1st. some interesting romantic twists as these neophytes struggle to learn the genre. In Strollin & Twistin at the Mai Tai,. OBS regulars Jay Barker (DiLuca’s Pizza and Songbird Christmas) and Kelly Nevius (Forever Plaid and Who The Hell is Holly Miller?) are joined by Rebekah Martino, Kristen DeKowzan and Tasa Proberts (All three from Sweet Nothin’s). With inventive choreography by Tina Marie Kelly and a varied collection of all your favorite songs of the period, including hits by Bobby Vinton, Elvis, The Platters, Jerry Lee Lewis, The Righteous Brothers, The Chiffons, The Beatles, The McGuire Sisters and many more, this talented cast will take you on a wonderful, nostalgic journey to “The Golden Age of American Bandstand” (1955-1965). Strollin & Twistin at the Mai Tai has laughs and great music and is suitable for all ages. show reservations, please call OFF BROADSTREET at (530) 265-8686 or (530) 478-1213 or visit the OFF BROADSTREET website at www.offbroadstreet.com.